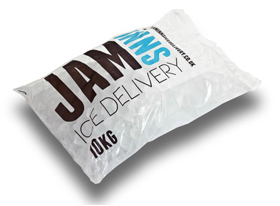 Jam Inns Ice Delivery is the South Wests largest ice supplier delivering to events, festivals, nightclubs, bars, restaurants, weddings, private parties, airports & large commercial contracts for retailers & supermarkets in the South West of the UK. Based in Bristol we cover a 50 miles radius of Bristol City Centre. Our core business is supplying bagged ice in 10kg bags. We have a minimum drop of 4x 10kg bags & can supply a daily capacity of 10 tonnes per day. It doesn’t matter if itâ€™s a garden party at home in the summer with a small group of friends or a supermarket chain with daily multi-site drops on 1 tonne pallets we are the number 1 supplier & wholesaler of ice in Bristol. DON’T LEAVE IT TO LATE TO ORDER ICE. SATURDAYS BOOK UP SOMETIMES A FEW WEEKS AHEAD IN SUMMER. IF YOU NEED ICE JUST BOOK IT IN. All our plastic bags used for Jam Inns Ice are 100% recyclable. Our ice machines at Jam Inns Factory use the latest Hydro Carbon technology to reduce water waste & use less energy in the production of ice. We are a local supplier only in the South West & Wales so our carbon footprint is low from the point of production to the delivery of the end product. To sum this up we’ve considered carefully the use of the best plastic possible for the ability to recycle. We’ve invested in machinery that will reduce water waste & energy waste & as a company covering a relatively small area we have a low carbon footprint.